With respect to the transportation of precast concrete structures through Watertown to the Athena construction site, we as a Department have conducted numerous meetings in an effort to reduce the impact to any given section of roadway and to reduce the impact to our residents, businesses and traffic traversing though Watertown. The meetings have been very complex with participation from the Police Department, the Planning Department, Athena Management and C.E. Floyd (Athena’s Construction Manager). They will be transporting 85 foot long by 12 foot wide concrete structures from Ayer, Mass (your average trailer truck runs between 45 feet and 53 feet long) and the route selection issue is a very complex one which requires the consideration of bridge capacity and turning movements at every intersection for the entire transportation route not just the transport through Watertown. I believe it is important to state that the ultimate permitting authority to determine over the road approvals for such transportation lies with MassDot. Other surrounding communities will be impacted by the truck traffic without the ability to add additional restrictions, however, as the community that is hosting the development project, we have imposed additional restrictions and requirements above and beyond the MassDot permit requirements. 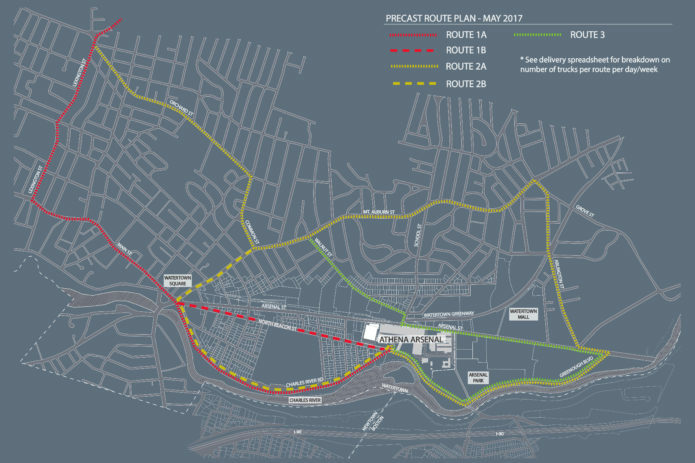 The staff determined that it would be a preferred option to utilize multiple routes through Watertown to the Athena site and to restrict the truck traffic in Watertown for the precast structures between the hours of 9:30 AM and 3:30 PM. Prior to our meetings, Athena and their contractor solicited and received approval from the Department of Conservation and Recreation for use Charles River Road as their primary road for transport into the site. As we discussed this matter further, and reviewed many alternatives, we believe that the Charles River Road route is possibly the best point of access to the Athena site. We also believe that a distribution of the large number of trucks would be a more effective approach and potentially improve the coordination of vehicles turning into and out of the site. After our initial discussions, we requested that the proposed routes be tested to verify their feasibility which also lead to researching some additional alternatives. I would like to reiterate that the Watertown Department of Public Works is utilizing its authority to restrict and determine these routes through Town due to the project being in Watertown. Ultimately, the transport of these materials have been permitted by MassDot and DCR and are considered to be legal loads coming through all of the communities from the manufacture’s facility in Ayer. The Department of Public Works and our team are well versed at these transportation issues as we have dealt with similar situations numerous times in the past and have worked diligently to coordinate our efforts and lessen the impact to our community. We are allowing this process to move forward with the multiple routes (attached) and have authorized the trucking to commence on Friday, May 19th with additional reporting and monitoring requirements throughout the project. We expect to bring in 15-25 trucks per day through the early fall. During that time, activities on the site will include, but are not limited to; garage assembly, concrete pouring, and underground utilities work. As always, with any construction project there may be unanticipated conditions, including weather and route availability. Our plans may adjust subject to appropriate review and approval by Town Staff, DCR, and/ or MassDOT, to the extent each has jurisdiction. Over the next several months the historic fence at the West Garage project site will be removed and taken offsite. The south side (North Beacon Street) of the site will be restored and reinstalled in the early fall. The north side (Arsenal Street) of the site will receive a new frontage, without the fence.